The Sweetie Pie quilt pattern is easy as pie and cute as a baby! With the Sweetie Pie Quilt Pattern, you can quickly strip-piece the 9-patch blocks and set them together with an Hourglass block. And that's it--you're done! 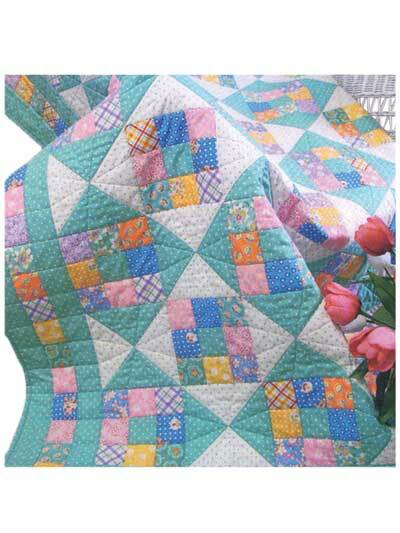 This quilt pattern is a great project to use up scraps (or fat quarters). Make the Sweetie Pie quilt your way, any size, with your favorite fabrics! The quilt pattern includes instructions for a baby quilt, lap quilt, twin- and queen-size bed quilts. Love the quilt pattern. Looks very easy but appears like a much more complicated pattern. I haven't had time to use it yet, but I know I will love it already! Love the pattern! I needed a quick baby quilt and this was perfect, I will use it again and again. I love this pattern. It is easy to make and follow the pattern. I love that you can make it in different sizes. I made two with different color schemes and they looked so different! Great Pattern. I have not used this pattern as of yet. But I can see how it would be a very easy pattern to follow. 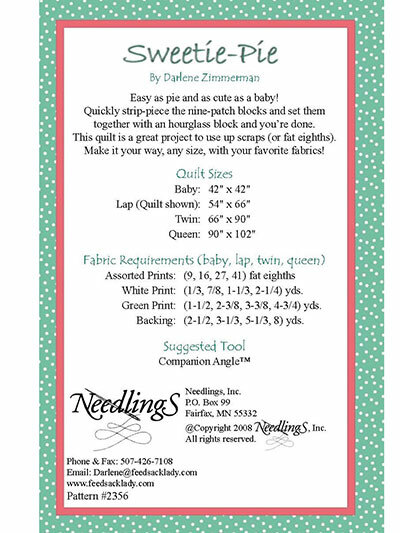 I bought this pattern to give to a friend who wants to start quilting. It would be a nice starter quilt. Very pleasing to the eye.